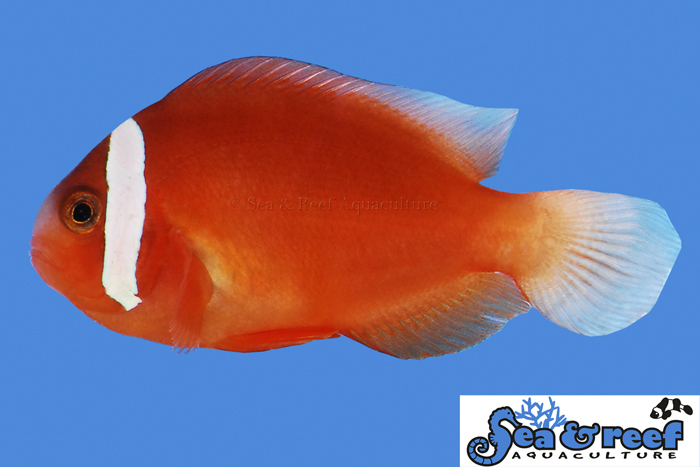 Barberi Clownfish is a newly described species from Fiji and we are proud to announce that Sea & Reef is the first hatchery in the world to offer this species as captive bred. Renowned fish expert Dr. Gerald R. Allen described Amphiprion Barberi Clownfish in the June 2008 Issue of International Journal of Ichthyology. Earlier this species was thought to be a color variation of the Cinnamon Clownfish (Amphiprion melanopus), which is widely distributed in the Pacific Ocean. Barberi Clownfish can be distinguished from Cinnamon Clownfish by its coloration and the number of gill rakes. The Barberi Clownfish has uniform orange to red coloration whereas the Cinnamon Clownfish has a darker red coloration with a pronounced “saddle”. The Barberi Clownfish also resembles the Tomato Clownfish (Amphiprion frenatus). Tomato Clownfish have bright red coloration as juvenile fishthat changes to darker red as they mature (almost black coloration in larger females). In contrast, the Barberi Clownfish keeps its uniform orange to red coloration from juvenile to adult fish. As the Barberi Clownfish mature their head coloration will darken. Also, we have observed that in some Barberi Clownfish the first finray in their pelvic fins turns black as they grow larger than 1.5 inches. We acquired some of the first Barberi Clownfish from Fiji after this species was recognized. The pair bonded and began spawning in early 2012. The first captive bred Barberi Clownfish left Sea & Reef’s hatchery in September 2012. Barberi Clownfish are found in Fiji, Samoa and Tonga. Barberi Clownfish grow to a large size and often become a dominant species in smaller saltwater aquariums. Though they will defend their territory with vigor they will peacefully coexist with most species of fish not belonging to the clownfish family. Their beautiful look, hardiness and bold behavior make Barberi Clownfish a suitable choice for the novice saltwater aquarist. In the wild Barberi clownfish are observed hosting in the Bubble Tip Anemone (Entacmaea quadricolor) and the Magnificent Sea Anemone (Heteractis magnifica). Clownfish do not require host anemones to survive or thrive. However, in most cases they will readily accept them and for the Tomato Clownfish we recommend the popular and hardy Bubble Tip Anemone (Entacmaea quadricolor).